I want to tell you all about my “encouraging” or “not so encouraging” conversation from Whoopi Goldberg during my recent visit to the The View. I wrestled with whether or not I should blog about this incident. But in any event here it is…. So, today (April 2, 2012) I was an audience participant in a showing of The View. Now you all know that while I was there, I was just being myself. If you know me you know what that entails… Tee hee :). If you don’t know me, well, that just means I was just being my bright and bubbly self :-). So, on with the visit! It was very cold in New York at 8 a.m. this morning outside of the ABC studios. After waiting outside in the cold for an hour, we finally were able to come inside and stand in the lobby for another hour and a half, with allowance to use the lady’s room–of course. I’m not saying, but I’m just saying — I’ve been to other shows and we sat in chairs before we actually went into the studio. Just sayin…. But while in the lobby I was able to meet a few people, crack a few jokes and make a few folk laugh so we had a lovely time in the lobby “behind the velvet rope” standing! (Again….I’m just saying!) We finally got into the studio, WOOHOO! There was a dance line and of course I’m picked to go down and dance among five other people. Was there even a doubt that I would be one of the chosen few? No! Tee Hee. They didn’t expect me to be able to move so fast but my feet were moving and I was cutting up getting my salsa on!!! Bam!!! Me: Joy asked me if I could sing and I sang ……. 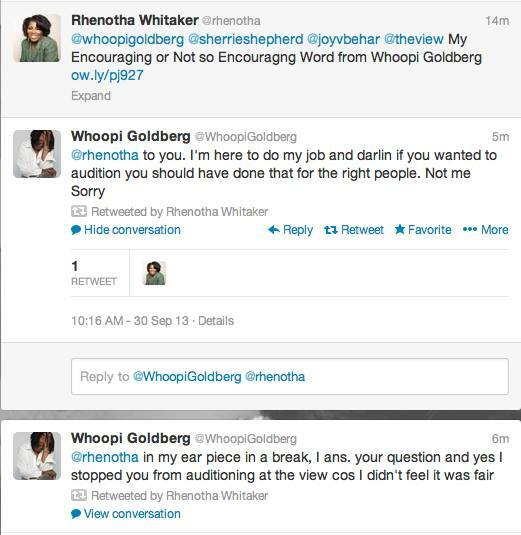 Whoopi: Well I’m gonna kick Joy’s A** for asking you. The thing that you have to remember is if you are cast for a Broadway show like this, you must have stamina and training and be able to do 8 shows a week. But I will say this you can view the castings and apply. Me: I’m up for the challenge I think I can. Whoopi said we just cast Raven Symone in a way that was like, “Yeah….it’s Raven Symone,” not just some woman in the audience trying to get an acting job. She then explained how strenuous it would be on the show as if I were not up for the challenge. I don’t know how you are feeling about reading this thus far but I can tell you that I felt a little insulted and that Whoopi’s comments were meant to have me discouraged. No current actor or singer knows what’s ahead of them until they get there, but at least they are apt enough to try! To those of you who don’t know that I am an amateur singer, entertainer and motivational speaker, below you can find some of my work and I hope you will continue to keep me ENCOURAGED! My pastor preached this word in Revival last week “Why you picking on me? John 12: 9-11 He preached on how Jesus raised Lazarus from the dead and how after he was raised there was a plot to kill Jesus and Lazarus again. One of the lines in the sermon was “Your HATERS plots and schemes only MAGNIFY God’s PROMISE!” I’m destined for greatness and I’m not going to let anybody stand in my way!!!!! Ask and you shall receive. Knock and the door will be opened! A closed mouth doesn’t get fed! And the squeaky wheel gets the oil. If anyone else finds themselves in a situation like this, don’t be defeated but use this as an example and overcome anyone’s expectations or thoughts of you and do your best to DO YOUR BEST! Thank you to my Aunty Angela Robinson for affording me the opportunity to attend today’s live show and thank you Joy Behar, Barbara Walters and Elizabeth Hasselback for saying that I have a wonderful voice. I thank you all for your encouraging words that outweighed the negative. 🙂 Just like I told Dr. Phil STAY WITH ME I’M ON MY WAY SOMEWHERE! AMEN SOMBODY! I was at a Jennifer Hudson concert and after a crowd participation song she picked me out of the audience to sing with her!!!! Click link below to see it. ← You know I’m Fabulous right? So Why am I losing weight? I believe that Whooping is a great actress, orator, comedienne. I also believe that she was being a bit harsh with you. You asked a question. I don’t think you thought she would be a tad belligerent! Everyone is looking for their first start! I believe Whoopi has lost sight of the little people or people who haven’t quit made it yet. You have the right to speak up and be heard. You did the right thing and no you aren’t defeated she will one day regret what she said and did. While you will be a rising star that she won’t be making money off of. Keep going, keep your head up and never stop speaking up. I am in awe that you did tell your story. I was one of those people that allowed others to be mean and not say anything back. You are one of those special personalities that the world should get to know! I think Whoppie forgot where she came from. At one point she was an unknown. Thank You Chappy, I believe in standing up for yourself. If you don’t stand for something you will def fall for anything. We all had to start somewhere! Love you to pieces, NaNa … and keep on doing you! Amen Bink thank you for speaking things as though they are!!! I receive it! Intentional or not, the result was one that caused an emotional affliction. Being a child of the King, just remember that offences will come, but if you remain humble and let God’s will be done this will just be another step up for you and not a step back. Remember, all things work together for good, to them that love God and are the called according to His purpose. GO Miss O!! Girl, she was out of line and borderline disrespectful in my opinion. However, I told you a few weeks ago what God had for you is for you!!! Love you! Girl, you are fabulous, you know it and don’t ever forget it! I would like to give you a tad bit of advice that I have learned over my 44 years 🙂 Everything that’s seems negative isn’t negative. By this I mean, there is a lesson in everything we experience. Usually we don’t get that until the end of the lesson. Let me give you an example, albeit a little more extreme than your experience, but a good example I believe. I am from Orange/East Orange and I moved to Bethlehem, PA nine years ago. Back at the end of 2002, I moved from an apartment that I had lived in for 6 years into a friend’s private home who had moved to Brazil. No, I didn’t live there for free, I paid rent. 🙂 I always loved his home and he wanted someone that he trusted that he could rent to. Oh by the way, at the time I was a single mother of a 15 yr old son and a 2 yr old daughter. Before entering into this deal, I asked all the relevant questions, especially “Do you plan on selling the house any time soon?” I was told “No, not for atleast 5 years.” Well, that beautiful house that I loved for years was basically a “Money Pit” (think the movie). Everyday I came home from work and something was wrong with the house, water leaks from the upstairs bathroom down into the kitchen, another bathroom that had been remodeled, but no heat source installed so that bathroom was so cold we could never use it. The heating system didn’t work properly, very noisy neighbors, no one ever cut the grass or shoveled the snow, (I was told a neighbor was paid to do this). One day a Real Estate Agent came by the house to let me know that they needed to schedule time for “Open Houses” What!!! Mind you, I had not been living there six months, I was a single mother who works all week, shops and does laundry on Saturdays and rest on Sunday and now I’m told that me and my kids need to be gone every Sunday, all day! You know I was “HOT” and gave my so called friend a piece of my mind. I ended up shopping for a home to own because, I was tired or renting and living by someone else’s rules. Since I could not afford a home in NJ (one of the most expensive states to live in) I started looking just over the border in PA. When I found my home in Bethlehem, PA I could not believe all the space and the price! I bought the home for me and my children and my son and daughter flourished in this community. In the EO school system, they tried to tell me my son had a learning disability, which I knew wasn’t true, but that’s another story. When we moved to PA, the very first semester my son made honor roll and every semester after! I was so pissed off at my friend for doing what he did and I was so stressed everyday wondering what problem I was going to come home to. However, once I moved I was stress free and open to the lesson. I realized that all that happened and what I went through was to get me to where I needed to be. It also averted a possible tragic situation. Through all my stress living in EO I did realize that my son stopped wearing his favorite color, blue. I didn’t really delve into why until we moved and he started wearing the color again. He told me that he couldn’t wear blue in EO because they were “Crip” colors. I was aware of gangs, but I had not realized ow they had seeped into the EO community. Had I not moved, who knows where my son would be today. God allowed me to go through the horrible situation I experienced, because it was imperative that I get my son out of the community we lived in. God knowing me so well, he knew the situation had to be so dire that I would move swiftly and with precision focus, which is exactly what I did even though my entire support system was in Orange, EO, Newark and surrounding areas. I am no longer upset with that friend because I now know he was part of the big picture to get me to where I needed to be. 🙂 So, the lesson that I learned from that situation and from other sources is that everything that happens is supposed to happen and there is a reason and a lesson. When someone is negative to you or whatever the negative situation is, breathe and ask yourself “What is the Lesson?” Until you learn the lesson in any situation, you are bound to continually be confronted by it. Maybe the lesson in Whoopi’s reaction to you, was to prepare you for just that type of reaction as you move into the cut throat business of entertainment. I’m sure you know that you will hear more “No’s” in the entertainment industry than yeses (my cousin was in the industry and I still have several friends in all aspects of the business and the stories I hear are atrocious). Thank You Michelle!!!!! I really appreciate you sharing your story! And I read every bit of it! :-D. God knows just what He is doing and I am just following His lead! Oh, Sweetie! So hurtful! But you have to remember there’s no holding back with Whoopi, she’s going to speak her mind whether it’s offensive or not. Keep being your lovely, fun self and don’t let anyone stop you! Hey Hunney!!! She seemed to be thrown off at why you would bring up the casting question at The View tapping, which just was not the right arena. Joy was wrong to ask you to sing because all parties who were interested should attend the casting call. It’s just a learning experience….you will grow from it.